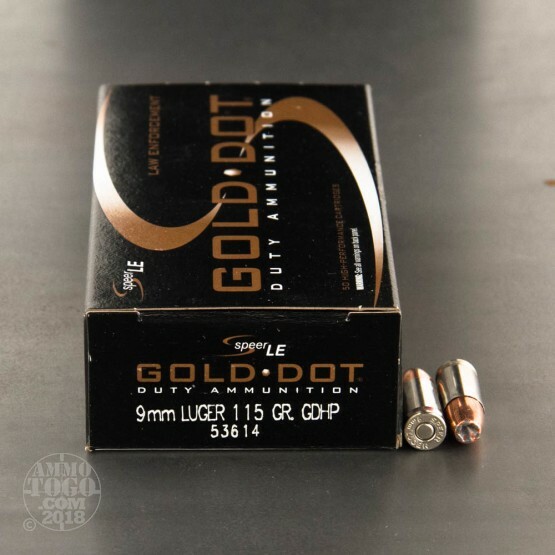 Speer Gold Dot ammunition is nearly unrivaled in measures of performance and represents the product of constant research, innovation, and technological revision. 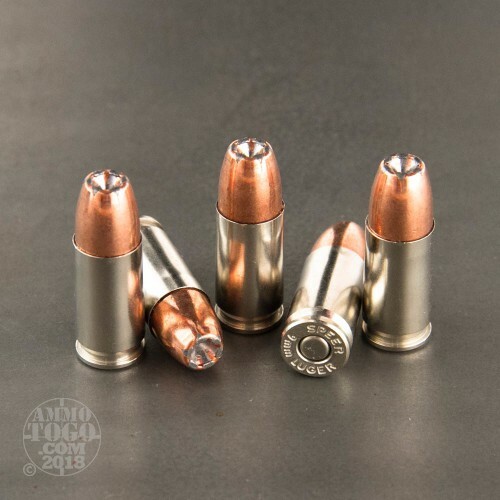 These 9mm Luger rounds are constructed using reloadable brass casings which are nickel-coated for smooth feeding and extraction as well as for resistance to the elements; casings are fitted with non-corrosive Boxer primers from CCI (sister company to Speer) which carry the best reputation for reliable ignition. 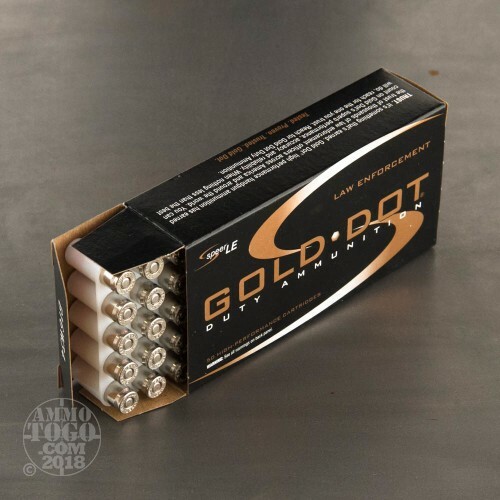 Gold Dot ammunition is legendary in the law enforcement community due to its unique jacketed hollow-point (JHP) design. The projectile's hollow cavity is integrated into the copper jacket at the tip with precisely placed openings and serrations. This arrangement results in dependable expansion with a controlled opening rate which creates a wide wound cavity without spoiling deep penetration. 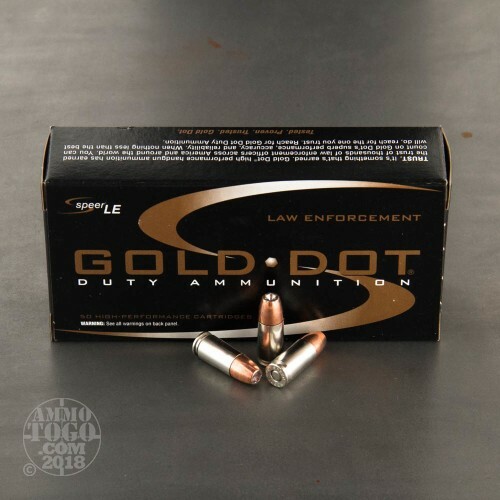 The Gold Dot projectile is formed using Speer's Uni-Cor process which creates a strong bond between the copper jacket and lead core that prevents momentum-sapping separation. These cartridges utilize flash suppressant in their powder mixture in order to preserve night-vision and enable quicker follow-up shots. The 115 grain weight combined with a standard pressure charge offers light-recoil and a relatively flat trajectory. We shot five of these Speer rounds through a four-layer cloth barrier using a S&W M&P Shield. The results are detailed in the video you see above as well as the photographs. 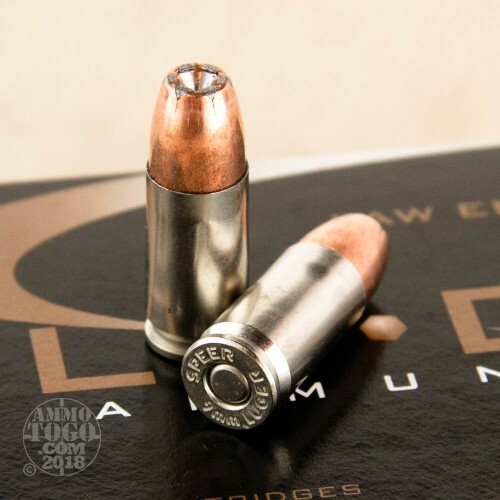 Through the charts, you should get a great idea how this Speer ammo stacked up relative to other 9mm Luger (9x19) ammo products available to American shooters. How do the results for this Speer 9mm Luger (9x19) compare to other 9mm Ammo? Expansion Diameter Compared to All 9mm Luger (9x19) Ammo Tested MIN 0.32" MEDIAN 0.50" THIS AMMO 0.35" U.S. dime MAX 0.90"
Penetration Depth Compared to 9mm Luger (9x19) Tested 0" 10" 20" 30" MIN 5.6" MEDIAN 17.7" THIS AMMO 33.6" MAX 47.5"